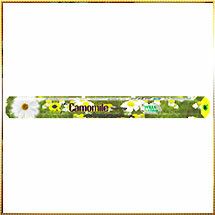 Camomile is the national flower of Russia, commonly named for daisy like plants. These plants can be made into tea, consumption of which reduces stress and aid sleep. White petals with yellow like bud in between makes this flower appear soothing and gentle. And when it comes to fragrance, the experience is truly magical. Therapeutic use of camomile in extract, infusion form, and ointment is also recommended by some of the medical practitioners. Being innovative, we have bring forth premium range of camomile incense sticks that too releases the stress of both mind and body. Our camomile based incense sticks comes under the genre of "mild fragrance" that truly captures your heart. We have made this exotic camomile incense stick from carefully selected camomile flower petals having long-lasting fragrance. The aroma of these sticks infuses a meditative state of mind creating a heavenly experience during rituals. Their stimulating fragrance released from the smoke enhances the effects of rituals performed during prayers. All of these factors owe to its high demand in the market.